When you’re building out your car audio, a set of 4” speakers is almost the default option. While you can obviously go much larger, 4” speakers can deliver a more than capable sound when partnered with the right amp and wiring kit. The added bonus of a smaller set of speakers is that they won’t run you too much so you’ll have plenty of cash left over for a rock-solid amp and subwoofer. We’ll look at 6 of the best 4” speakers then we’ll guide you through what to look out for so you can streamline your buying decision. 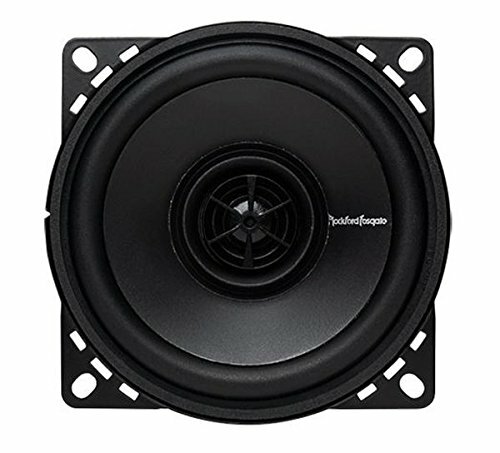 Who Are 4” Speakers Good For? What Should You Think About When Buying 4” Speakers? Available in a range of sizes including the 4” we’re focusing on today. For a winning combination of brand heritage, solid components and rugged build quality, these 2-way full-range speakers pack quite a punch. The added beauty is that come in at an almost budget price-point so if you’re looking for affordable 4” speakers that don’t sacrifice sound quality, the R14X2 are hard to beat. Rockford Fosgate deliver top-tier car audio at respectable prices and this pair of 4” speakers is no exception. These dinky speakers are a smart bet if you’re looking to uprate your factory speakers without needing to spend a fortune. You’ll be rewarded with a clean, lean sound at a very cost-effective price point. Power handling is more than fit for purpose at 30 watts RMS to complete a very nimble package. 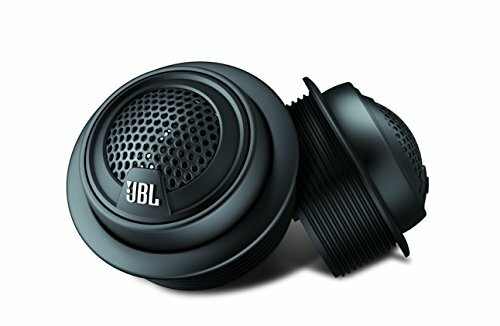 JBL enjoy a strong reputation for peddling top-tier car audio at a relatively reasonable price point. Producing audio for more than a half-century, JBL’s expertise comes fully to the fore with the GTO429s. Melding sound quality with durability, these capable 4” speakers will make you wonder why you didn’t upgrade long before. Now owned by Harman International, JBL Audio continues to mine the same lode of producing outstanding audio equipment that delivers across the board. Power handling is an impressive 50 watts RMS with 105 watts of peak power. This volume doesn’t come at the expense of sound quality, though. Dipping down below 80hZ and rising above 20hZ, you’ll get impeccable, clean sound across the full range. Sensitivity is high and these 4” speakers work equally well whether you have a real powerhouse of a sound system or something rather more pedestrian. Throw in components that are built to stay the distance, striking looks and that all-important brand heritage and the GT0429 represents a standout winner in the 4” speaker category. 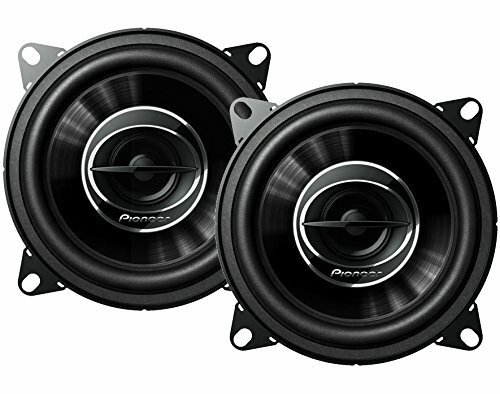 Pioneer is a staple when it comes to budget-friendly car audio without resulting in cheap tat. This pair of 4” speakers might be cheap but they’re built to last and deliver more than acceptable sound quality if you’re looking to uprate your stock system. Power handling could be more potent but the difference compared to factory-issue speakers makes the small investment very worthwhile. Firstly, you need to be realistic about what you’ll get from 4” speakers in this price range. We’re not going to tell you these will thunder out bass-heavy tunes at ear-splitting volume but they’ll certainly make a telling difference over most standard-issue speakers. Power handling is a modest 20 watts RMS and, while the bass leaves something to be desired, overall sound quality is more than acceptable. Sensitivity is above average and you’ll get relatively little by the way of distortion. If you’re looking to buy into a trustworthy brand on the low end of the price band and you have less than exacting needs when it comes to your 4” speakers, the Pioneer make a sound investment. 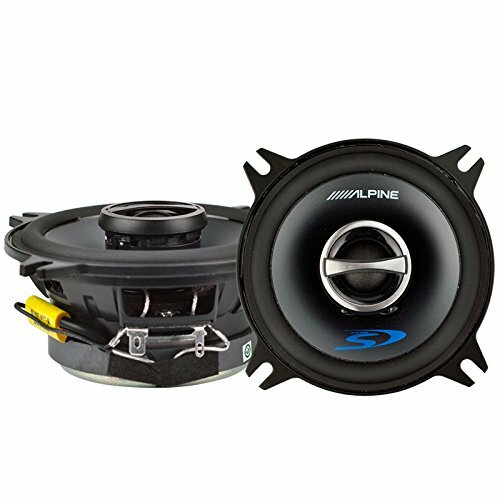 Alpine is a stealth option if you’re looking for a dependable car audio brand that doesn’t cost the earth. This pair of co-axial 4-inchers are better suited to mids and highs than crushing bass but the overall sound quality is more than you’d expect at this price. Build quality is exceptional and power handling is more than adequate. This pair of speakers is worth a place on any shortlist. All 4” speakers involve some degree of compromise and these Alpine are slightly lacking on the bass front. That said, mids and highs are extremely well represented and you’ll enjoy a rich, clean sound that substantially outflanks most factory speakers. Ultimately, that’s the main goal of dinky 4-inchers and the Alpine meet it head on. RMS power is 45 watts per speaker so you’ll get reasonable volume for a smaller set of speakers. There’s little distortion thanks to the nicely centered woofers and the tweeters bring the higher frequencies to life. While you’re not going to storm off with first prize at a car audio comp, the Alpine SPS-410s are well worth your further investigation if you’re looking for a simple upgrade. No list of the best 4” speakers would be complete without an entry from the legendary Kicker. If you’re looking for an extremely slimline speaker solution, this nifty little pair is just what you’ve been waiting for. With grilles and mounting hardware thrown in and a pocket-friendly price, what’s not to like? While the overall build of this compact pair of 2-way 4” speakers leaves something to be desired, there’s little else that stacks up in the negative column. 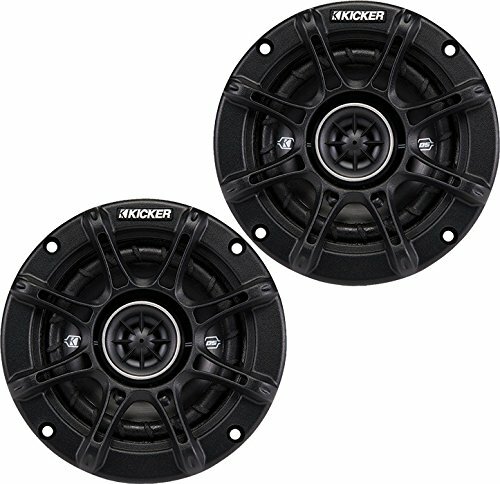 For a simple tweak to your factory speakers with a hard-hitting reward, these Kicker 2-ways are a wise bet. Power handling is claimed to be 60 watts RMS although that’s perhaps an ambitious estimate. You will, though, get more than enough power for most reasonable needs. As long as you keep the volume away from the upper end, you’ll get almost nothing by the way of distortion. If you punish these speakers too hard, you’ll soon notice their limits. Dial it back and you’ll enjoy a crisp, clear sound. If you don’t want to outlay too much but you want some serviceable 4” speakers, the Kicker 41DSC44s might just surprise you. The Infinity Reference series are available in a broad spread of sizes and options. This particular set of 4-inchers fall somewhat short on the bass front but deliver fully in the low and mid ranges. Power handling is acceptable and the price won’t leave you feeling seen off. As with all small speakers like this, if you peg your expectations, you’ll end up with a significant upgrade to your sound system without needing to spend a great deal. Last but absolutely not least, the Infinity Reference 4022cfx are a rock solid option if you want affordability married to build quality and you don’t mind taking a bit of a hit on the bass front. Infinity rolls out their patented Plus One+ woofer technology featuring oversized cones for a nice depth of sound. Power handling falls somewhere short of impressive at 35 watts RMS but you’ll still get noticeably more grunt than most factory units serve up. Assuming that you’re not obsessed with a driving, thumping bassline and you want some budget 4” car speakers that don’t sound like a budget choice, you could do far worse than this Infinity Reference pair. Now that you’ve got a decent spread of 4” speakers to whittle down into a shortlist, we’ll give you a few pointers to help you make your choice. The simple answer is, not for everyone. If you just want a simple and inexpensive upgrade to get enhanced sound quality over that offered by your stock speakers, a small set of co-axial 4” speakers makes perfect sense. Most vehicles come equipped with the correct sized holes and installation is straightforward. Another key advantage with 4” speakers is that you’ll be spoiled for choice. Because there are so many options glutting the market, we’ve deliberately stuck with 6 to save you from analysis paralysis. Once you’ve decided that this size speaker is what you’re looking for, there are a few crucial elements to consider if you want the best 4” speakers for the job. Power of speakers is measured in watts. What you need to be aware of is that most speakers are advertised with an emphasis placed on peak power. This is understandable since the peak wattage is higher and looks impressive. You should focus instead on RMS power handling, also known as continuous power handling. This is a far more meaningful and practical metric. The RMS power rating makes it clear how loud you can jack things up without noticing any significant distortion. After all, it’s pointless cranking up the volume if it sounds like someone falling down the stairs. The number of drivers in your speakers will give you some indication of how well they’ll service the full sound spectrum. 2-way speakers have a tweeter in place of a woofer. 4” speakers work best servicing mids and highs so a subwoofer is one way of making sure you also cater for low frequencies. The sensitivity rating of your speakers is stated in terms of decibels. Linked closely to power, the focus here is on the range of sounds you’ll experience from your speakers. The higher the sensitivity, the broader the range of sounds. While a higher sensitivity rating is usually a wise target, if you’re using an external amp, speakers with lesser sensitivity can work well. To summarize, with higher sensitivity, you’ll get enhanced sound with less power for the win-win. Co-axial speakers are the easy option when it comes to installation. Just tie them into the wire harness in place and you’re good to go. That said, if you’re looking for a more comprehensive overhaul of your car audio system, component speakers make perfect sense. There’s no right or wrong answer here so think about your overall needs and how much you have to spend then buy accordingly. When you’re building out your entire system, tweeters and super-tweeters come into their own. You’ll notice more highs and a cleaner sound. Unless you plan to upgrade your entire system, though, don’t rush in and replace your 4” speakers with tweeters. The results could be underwhelming so think carefully about making this move. Are You Looking To Tweak The Stock System? 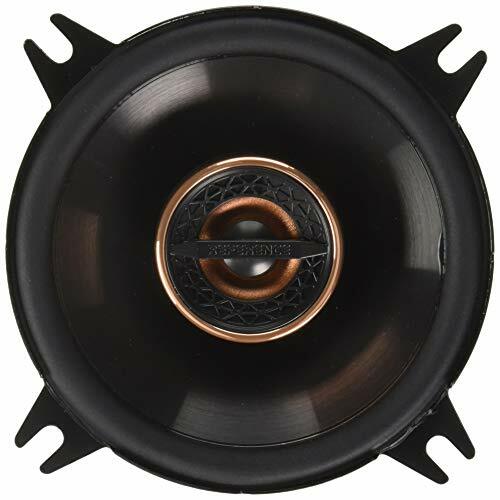 If this is your goal, a simple 2-way co-axial 4” speaker is the ideal choice. Do You Want a Complete Sound System Overhaul? Choose component speakers or possibly tweeters depending on whether or not you’re pushing an independent amp. We very much hope these 4” speaker reviews have given you some food for thought and you now have your eye on a new pair to fuel your sound system. Come back soon for more impartial advice on getting the very best gear for your ride without taking out a bank loan.